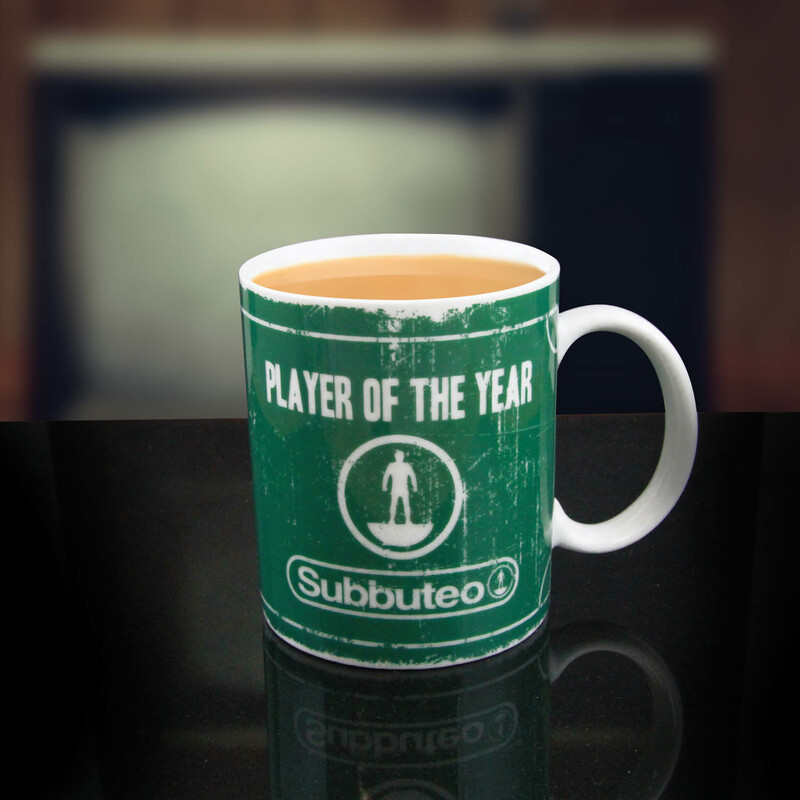 Let the player of the season lift the cup and reap the rewards of a well deserved brew with this classic Subbuteo inspired drinking mug. A standard sized (capacity 300ml) drinking mug kitted out in true Subbuteo style. With a scratched effect vintage style green pitch decal and ‘Player of the Year’ slogan and picture, this is the perfect cup to present to your football mad loved one. Subbuteo, (literally meaning ‘hobby’ in Latin) is the quintessential table football game, played by millions of football obsessives world wide. First created by Peter Adolph in the 1940s, the game took the world by storm as countless players recreated their favourite footballing moments and became their icons through the tiny plastic figures. Initially a children’s favourite, the game soon grew in popularity and became beloved by football fans of all ages. Subbuteo is a classic cultural icon that celebrates the beautiful game. 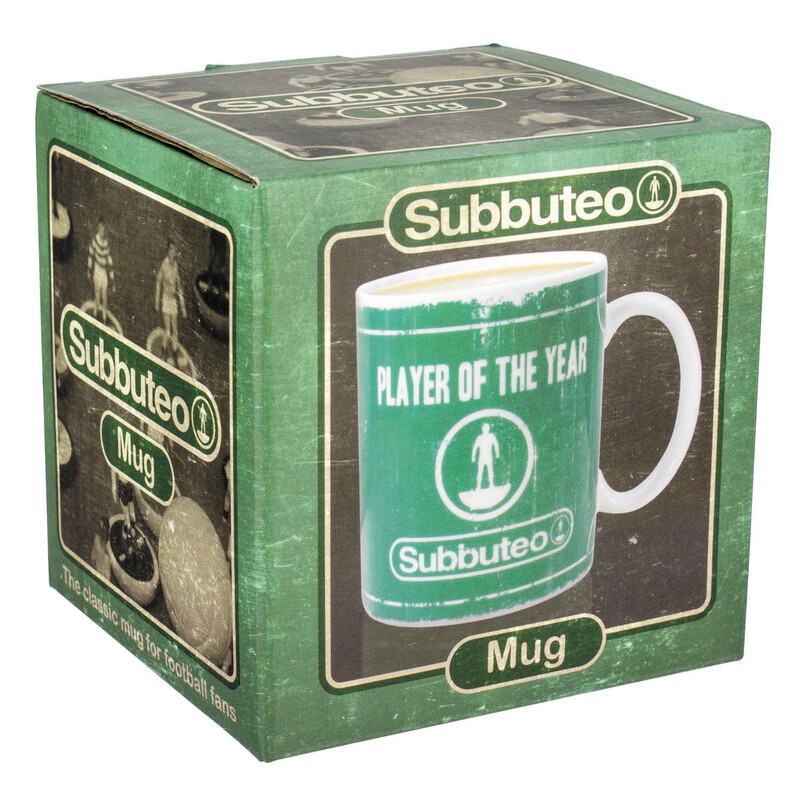 So take a half time break with a legend of the game, and whether it’s tea, coffee, or a traditional cup of a particular beef flavoured drink to get you going on match days, refuel in vintage soccer style with the Subbuteo Mug. The classic mug for football fans. Let the player of the season lift the cup and reap the rewards of a well deserved brew with this classic Subbuteo inspired drinking mug. Part of the Toy Box range by Paladone.